Matching the adiabatic entropy of the solar model and 1D models with mixing length ranging from 1.5 to 2.5 (blue lines). The inlay shows the difference. We calibrated the free mixing length parameter α with a 1D atmosphere code that employs the identical equation-of-state and opacities. We matched both the entropy of the adiabatic convection zone sbot and the entropy jump ∆s. For the Sun, we find values of 1.98 and 2.01 for α with sbot and ∆s, respectively. Hertzsprung-Russell diagram showing the variation of the mixing length for different stellar parameter with solar metallicity. 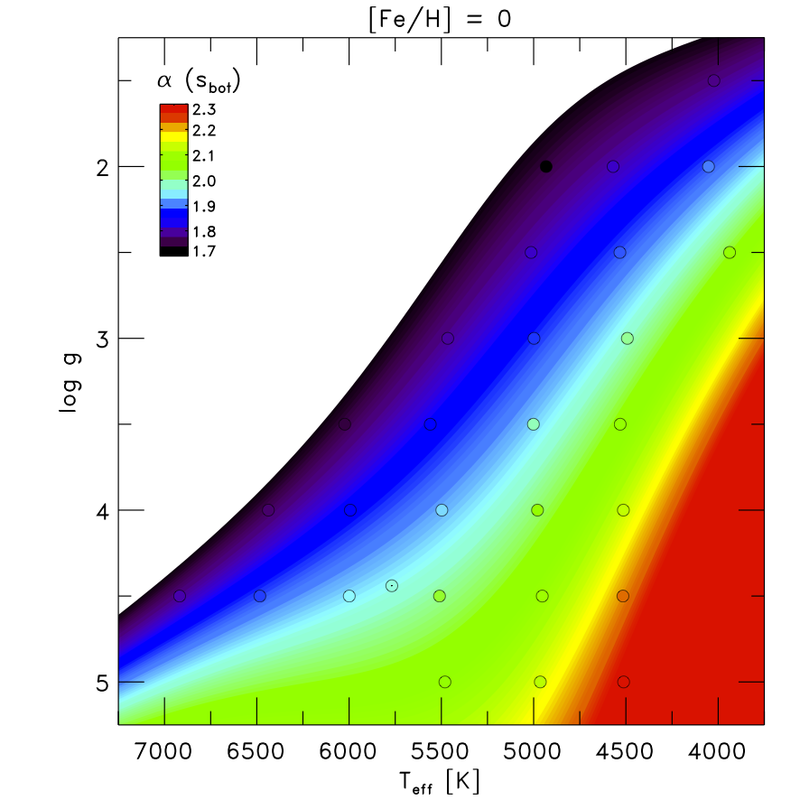 We find the mixing length to vary systematically in the range of 1.7 − 2.4, in particular, α decreases towards higher effective temperature (Teff), lower surface gravity (log g) and higher metallicity ([Fe/H]). The calibration data is available in the file table.dat with the Readme. If you refer to our mixing length values, please use Magic et al. 2015a as reference.